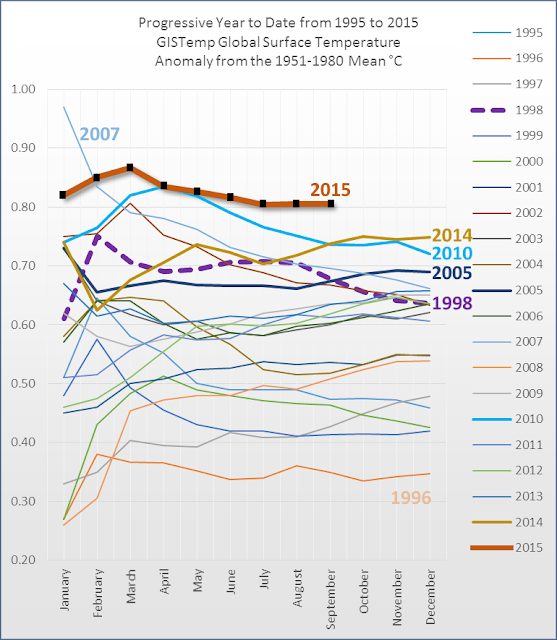 2015 is still hottest on record so far, and not showing any sign of dropping behind. The progressive year to date average up to and including September is 0.81 °C above the 1951-1980 mean. September was an average of 0.81 °C above the 1951-1980 mean and is the second hottest September on record, after September last year (0.90 °C). June this year was the hottest June on record. After late additions to the data, July dropped to being the second hottest July on record after July 2011. The highest anomaly this year is still March, now at 0.90 °C, which now makes it the third hottest March after March 2010 at 0.93 °C, and March 2002 at 0.91 °C. The lowest anomalies this year so far were April, now 0.74 °C, and July now 0.73 °C above the 1951-1980 mean. To drop below the hottest year on record, 2014 (0.75 °C), the average anomaly for the next three months would need to be around 0.58 °C, which seems unlikely. Especially given the El Niño and the fact that the lowest anomaly so far this year was 0.73 °C. The chart is a progressive year to date average, or running mean, for all years from 1995 to the present. What that means is for January each year, it just shows the anomaly for January. For February it shows the average of January and February for each year. For March, its the average of the monthly anomaly from January to March. 2015 is tracking above all other years, and not showing any sign of dropping (yet). The years to watch are 2014, 2010 and 2005. I've plotted them with slightly thicker lines so they stand out more easily. Some charts showing how temperatures evolved in previous El Niño years can be seen in this article: Why Christopher Monckton is getting nervous about global temperature. Here is the link to the table for the Year to Date chart. Greatt plot. We are very likely heading to a new record this year. However, we will keep hearing about "no warming since 1998". We will discover how long do some bloggers continue with this argument. Magma, you've stolen Lord Monckton's act. By the way, in his latest mathturbation, Monckton has moved the beginning of the non-pause to Feb 1997. His start point now stretches from August 1996 to Feb 1997. You'd think, having studied it so much, that he might have settled on a start point but... I forget that's not the idea of his monthly rambling. Oh no! Should I expect a threatening letter from the prolix peer's imaginary solicitors regarding theft of intellectual property? If you're lucky you'll get a writ on a silver salver delivered by his butler. It's one of the depressing parts of global warming that because it's a relatively slow moving process, people can keep re-calibrating what they consider 'normal'. "We are very likely heading to a new record this year." We are inevitably heading to a new record this year; just one of many. There is no way that the statistical weight of even the most extreme excursions from the momentum of the current warming could possibly take the 2015 trajectory below that of 2014. At the end of this year there will have statistically been no warming since some time around the turn of the millenium, ± a few years. In physical reality warming has continued unabated for many decades and will continue to do so for many, many decades to come... at least. And why? Because humans won't stop shitting in their only nest in the known universe. And a note for the stupid: the full effects of climate change lag the thermometer by centuries. There is no way that the statistical weight of even the most extreme excursions from the momentum of the current warming could possibly take the 2015 trajectory below that of 2014. I agree. I'm also thinking that this is all going to put a sizeable wrench in the cogs of the 'ECS will be below 2C' Bayesians like Otto et. al. and Nic Lewis. Otto et. al. was published in 2013, with data for 4 decades only through 2009. With 2014, 2015, and 2016 shaping up to be the hottest on record... if you were to add this decade to the analysis, the ECS using the same analysis has got to be much closer to 3C as opposed to the 2C they came up with. Not quite "no way." A major volcanic eruption could knock this year down in the rankings. I certainly wouldn't bet on it, but still we have to acknowledge that it's possible. How long does it take for the aerosols to spread? I thought it would still take a month or two after the eruption to see global effects. Is it much faster than I've understood it to be? It takes a few months. For Pinatubo, maximum effect on global surface temperature was about a year to a year and a half after the eruption. So to have a significant effect on this year it would have to be a really, really big eruption, stronger than Pinatubo and possibly stronger than Krakatoa. And it would need to happen soon. Our Spaceship Earth already has the aerosols of many fires that are nearly worldwide. Just have a look at Indonesia on the BOM site here. It's interesting that in 1997 - which with the emerging el Nino could be used as an analogy - the effects of the el Nino emerged towards the end of the year. Yes, Andrew, same for 2009-10. I plotted some charts a little while ago that showed the two years of El Niño for 97-98, 09-10 and this year so far. Next year could be even hotter again if those years are any indication. Lower troposphere (satellite) temps go up later than surface temps, too. There is about a half year (or slightly shorter) lag. 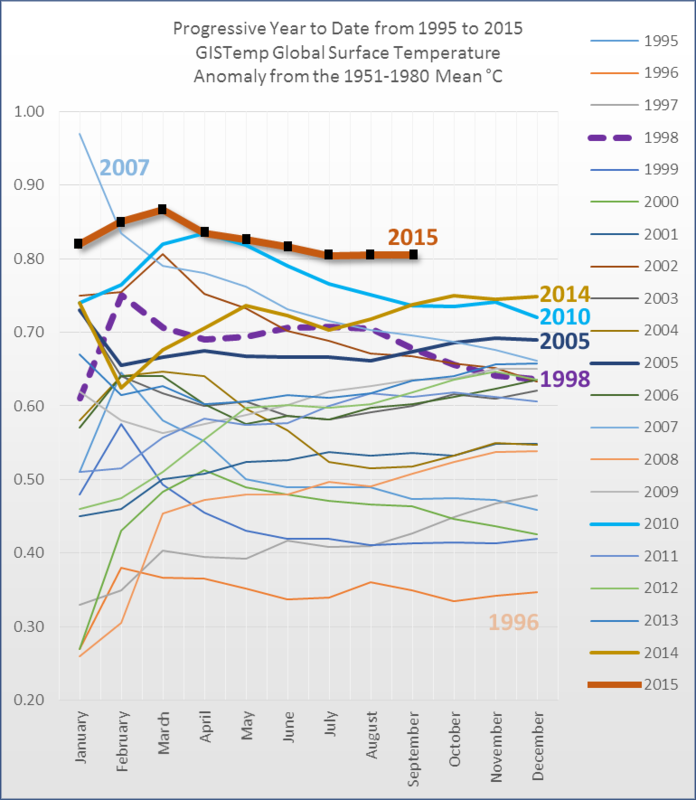 Are there any three-year periods on record that set successive temperature records (sorry), as 2014-2016 might? @wheelism, no, but HadCRUT4, GISTEMP and NOAA all come pretty close in 1995-(1996)-1997-1998, with only 1996 not being a record warmest-to-date year. The UAH and RSS tropical measures are on the rise. For the spike in the surface stations? My guess is that will happen after the El Nino increases precipitation across a large enough region - this will deliver a lot of latent heat. The other fact is we are tracking anomalies, not absolutes. So my guess is El Nino warming has more impact on the anomalies in the NH winter. Its certainly a very unusual kind of Ice Age we are experiencing. I have just published a post with my own plots of GISS data and some rather foolhardy monthly predictions to the end of 2016. I'm sure that many people, including regulars here can make better-informed guesses than me, so I have tried to instigate a contest. I have added your websites to my unofficial list of climate change nutters and cranks. To the King: Thank you for the kind compliment, but you didn't comply with the HW comment policy. "The next time someone tries to tell you that "it hasn't warmed since 1996" then show them this chart"
What's the point, they only believe in RSS data. From the source data (thanks Sou) I plotted the average of each month in 5 year blocks i.e a line each for 1995-99, 2000-04, 2005-09, 2010-14 . I don't think I can paste the chart into this comment, but with less year-to-year noise on the chart it's even more compelling. they only believe in RSS data. A. greed, xyz t. Some months ago there was a great deal of whooping at wuwt and elsewhere when Roy Spencer released "version 6.0" of the UAH temperature series. This was, surprise, surprise, in good agreement with RSS, partly because Spencer introduced a "diurnal correction" used by RSS that he had previously been highly critical of. The wattites used this agreement as evidence that RSS and the latest, er, adjustment, of UAH were therefore likely to be correct. Nobody pointed out that any temperature series that had been ADJUSTED should be automatically treated with suspicion. I realise that "nothing happens by accident" is a sign of conspiracism, but can it be coincidence that the re-tuned UAH, long promised, only emerged when an El Nino was a racing certainty? One is bound to suspect that it's been re-tuned to minimise the effect of a hypothesised El Nino this year and next. I doubt it'll help them much even if that's true. There is/was an initiative under a name hidethedecline - or something - which attempts to create a parallel universe of "untampered" temperature records.. That could be their last (?) resort, along with climate4you which looks sort of credible but afaik has an agenda..
Cugel, Spencer's latest revision of UAH came out before the present el Nino began. I think Spencer realised that the whole "pause" claim was looking pretty flaky, so he tried to bolster it with his "corrections". I don't even know if he's submitted the corrected series for peer review. It certainly hasn't found its way into the peer reviewed literature. Not that such things seem to bother his fans. Taking the least charitable position - that the parameters of the UAH method are tuned to minimise the warming given the available data - then the new method could be tuned to include available data plus a hypothesised typical El Nino to the end of 2016. Getting them a little ahead of the game. Just checked that hidethedecline/ruti page. Looks like it is slowly dying out all by itself - if the timestamps of "latest news" can be used as metric.. Sorry, that first word should be "Agreed", not "A. greed"
I believe that's known as a Freudian Slip. "A. greed" is a perfect start to the list of why big oil pumps money into faux climate researchers.